As a member of UFCW Local 400, you can enjoy special discount tickets to Six Flags 2019 Spring Season (April 6-22, 2019 & May 3-12, 2019). 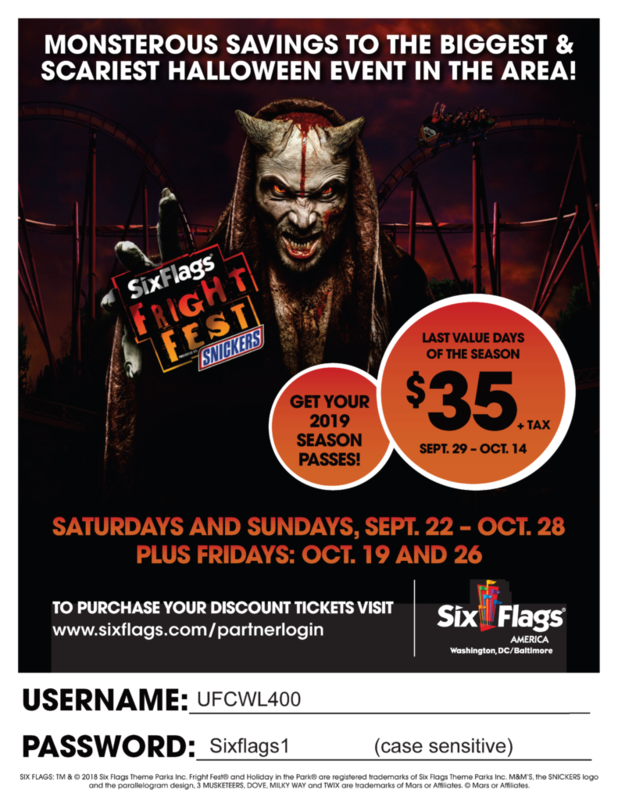 As a member of UFCW Local 400, you can enjoy special discount tickets to Six Flags Fright Fest (Saturdays & Sundays: Sept. 22 – Oct. 28 + Fridays: Oct. 19 & 26). Night game at Appalachian Power Park vs. Lexington Legends, June 12, 2010. Photo by ChristopherLocke. Free Game Tickets for Union Members & Their Families! Join us for “Labor Day” at Appalachian Power Park on Saturday, August 18. Free game tickets are available for union members and their families (four tickets per family). To obtain your application, please contact Liliana Chang at 703-931-5500. Deadline to apply is April 2, 2018.